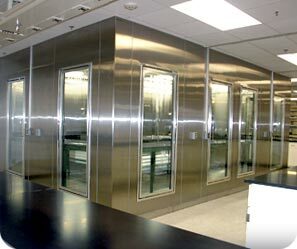 BioCold Environmental specializes in walk-in controlled environment room applications where close temperature and humidity tolerances are essential. Common applications include dry rooms, cold rooms, freezers to -40C, incubators to +60C, and humidity control from 10% to 95% RH. The quality of an environmental stability room installation rests in three major components: insulated structural panels, refrigeration systems, and control systems. At BioCold, we insist on the highest quality components and installation, ensuring that our rooms continue top performance for many years. With 30 years of experience, BioCold understands that no two projects are exactly the same. Our project engineers are available for project consultation, or view our controlled environment room specification for more information.